Humorous Twitter Character Fights Severe Drought in California – StratGo Marketing. Plug-in marketing department services. Changing behavior is one of the hardest things to do in marketing. In drought-stricken California, the nonprofit Southern California Water Committee (SCWC) has rolled-out a creative marketing campaign to persuade consumers to conserve water. Photo: Southern California Water Committee. For quick background, Governor Jerry Brown announced a drought emergency earlier this year. Last week, mandatory water conservation measures were implemented state-wide banning excessive watering, hosing of sidewalks and driveways, washing cars without a turnoff valve, and using fountains without recycled water. But will people really notice and change their habits? Enter the SCWC with its humorous, attention-getting outdoor advertising and social media marketing campaign. It’s a nice public-private partnership, since Clear Channel Outdoor has donated 25 digital billboards to get the message out. The focal point of the marketing is the creation of a Twitter-based spokesperson character, dubbed @Lawn_Dude. That’s so Californian! With a made-up character such as @Lawn_Dude, it’s critical to get the tone-of-voice right, and SCWC got off to a good start. The @Lawn_Dude ads will appear on digital billboards across Southern California throughout the summer. SCWC hopes to encourage Southern Californians to interact with @Lawn_Dude on Twitter and share billboard sightings and personal water saving practices. Good idea, and good luck. Changing behavior is perhaps the hardest marketing challenge. 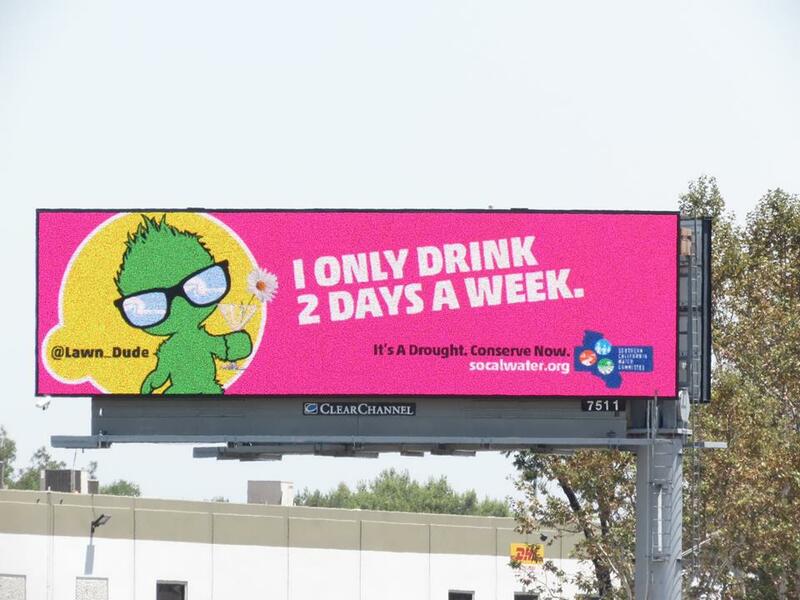 The Southern California Water Committee (SCWC) is running a humorous Twitter-character-based outdoor advertising and social media marketing campaign to get Californians to conserve water.